March 4 - It all started with "Jim, have you ever seen a boat sink?" I'm getting ahead of the story so we will have to work up to that one. Four or five days ago we looked at the calendar and figured out pretty quickly that our time in Key West was almost over. We had just taken Julie, a friend of Anna's, out for an afternoon sail and then we figured out we needed to get the boat ready to head north. I had been putting off removing the motor mounts on the engine so I could grind out a little on each bolt hole so we would have more adjustment for the engine alignment. 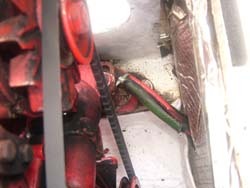 The picture of one of the motor mounts is to the right. It is hard to see but it is the thing under the hoses at the bottom. You have probably figured out that it is no easy task to remove these. I'll make it short here because I am going to write up the entire procedure for all Gemini people in about a week. When I got the front two mounts out, I looked at them and I didn't think they were good enough to put back in and trust them up to the Chesapeake. So I took them over to a friends boat who has much more experience in these things than I do and he agreed. Next was the "easy" task of picking up some new ones. I took them to the local marine dealer and he couldn't get them, I called the local Westerbeke dealer who wasn't there (thank goodness) and then called Engines One and talked to their Parts Manager. 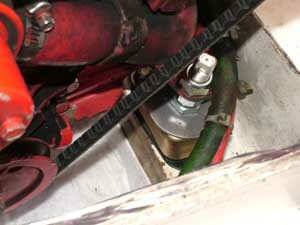 What I found out was the engine mounts listed in the Westerbeke book aren't the ones used in the Gemini. Probably everyone in the world knows this except me (I'll bet not!) but the good news is I called the right people and new ones are on the way but it will take a week for them to arrive in Key West. So, I had to put them back in otherwise I would have the front of the engine hanging off of the main sheet for a week. What if another storm came and I needed the engine? That was why everything went back together. It is also why I will write up the procedure in a week when I have actually done it all. The next day it was nice and breezy so after we went to town and picked up groceries, Deb wanted me to do her acrylic nails. For those new to the website, I had told her before I left that since she wanted to keep her nails that I could learn to do them since I had built my own airplane. We were finishing up the nails when Deb looked out the window and said "Jim, have you ever seen a boat sinking?" 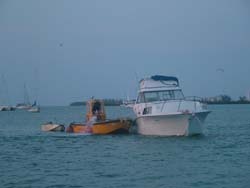 I looked back and could only see the bow and didn't think it was sinking and then I saw the stern. It was almost under water. I ran to the radio and called for Marine Assist who responded and we quickly got the location to him. I then called Tom, my friend down here, on the phone and told him to look at the boat, he of course said he would come and help. I took off in the dinghy to pick up things that were now floating out of the boat because the starboard stern was under water. Yep, completely underwater. Magic Penny arrived and went to the stern of the boat and hooked a line to pull up. I asked if I could board his boat to help and he, of course, said yes. I ran up and pulled on the hooked line while he attached a cable from his hoist to the cleat and hoisted it up some. He began getting his big gas powered pump out when Tom arrived and I had Tom come aboard too so he could help me pull up on the line. In the picture to the bottom left you can see we were successful in raising up the boat to this point and we even had Tom and then both of us in the rear of the boat to help bring the bow up. Problem was we stopped making progress. Arno, the operator of Magic Penny, had to put on his scuba equipment and go in to plug leaks. He used the foam floats we have all sat on in a pool to plug the holes from the engine exhaust, deck drains and any other holes around the boat. By the way, that is such a great idea we are going to buy two of the floats to keep in our hulls for the just in case scenario. This time I got to meet Arno and he is a really nice guy. He will probably receive nothing for his efforts unless he ends up owning this derelict boat and that wouldn't be compensation. 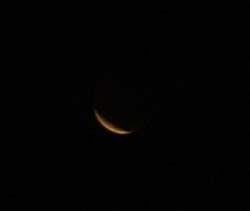 You can see from the pictures below we ended working into the early evening before the successful conclusion. By the way, the boat is still floating. 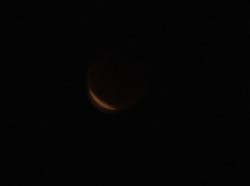 I don't know how many of you got to see the lunar eclipse last night but it was really cool. 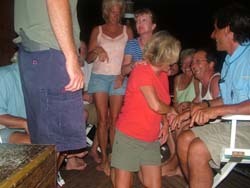 We had been invited with a number of other cruisers over to Tom and Susan's boat. You might remember that it is the BIG one. 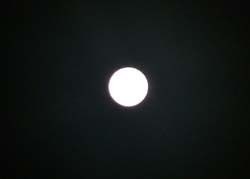 As we were just starting to serve ourselves dinner from the potluck, the moon began to rise and it was in total eclipse. Just too cool. 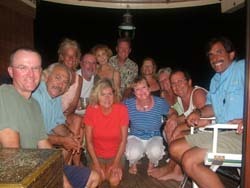 The last one was 3 years ago and here we are in Key West on the water enjoying this one with new cruisers. Last month we made mention that Dave and Betsy were our first cruising friends and we have having a blast meeting more and more people. The night was spent eating, drinking a bit too, and talking of where everyone was going next. Several people are leaving after this front moves through today, Sunday, for Mexico and then further south. We had a wonderful evening and it seems like part of the fun is figuring out how to get everyone in a single picture so they can be on the website. Well thanks to time delays in the digital cameras and multiple shots, we did get a group picture. There are two couples here from Canada in addition the rest of us from the States. Of course when you bring people together with a common interest it always makes a great night. It sometimes is even better with a little wine or at least I should say it gets louder as the night rolls on. Thanks again to Tom and Susan for being such great hosts on Juanita. We will be at anchor watch today because of the front that is moving through. This is the same front that all the tornadoes came out of up north. Fortunately, it seems to have decreased significantly so there should only be 20 knots or so of wind with some gusts and may build a bit more tonight. Something we both laughed about today was we think of 20 knots or so with gusts as not a bad front! I guess we are getting more experience. I've updated our budget page and you can read about it here. For the rest of today, I have to get our tax stuff ready to go and then next week we will be back to finishing preparations for the boat so we can leave on the 15th "ish" based on the weather. We will be hoping for another front so we can make it east. As you might know, with the trade winds from the east, we have to pick our window for leaving. Bottom line is we are running out of stuff to write about down here so it is time for us to move north. By the way, I'm not interested in saving another boat for your reading pleasure. March 7 - We spent most of the last 2 days on the boat with the winds. They actually weren't as bad as two weeks ago and only got up to 20-25 knots. We set up an appointment day before yesterday to have our taxes completed so Deb decided to go with me for the bike ride. We both wore our rainsuits for the dinghy ride in and out. Overall it wasn't as bad as I have been in before and we didn't take on water getting back out. Yesterday we went in to do laundry, pretty exciting stuff we are doing isn't it, and when we returned we decided at about 3:30 we would throw a few lures. We had heard the fishing was improving so why not find out. (And I thought I was out of things to write about!) We started by catching a couple of small grouper which we kept in hopes we would have enough for dinner. We found by experimentation the location of an old wreck within casting distance so we fished that with our jigs and the fish started getting bigger. Deb would catch one and then tell me she couldn't reel it in so I would go up front and reel it in. Sometimes it would wrap up in the wreck and break off. 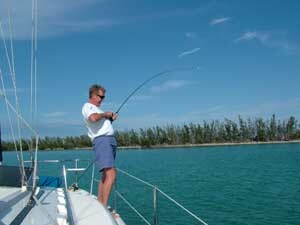 At that time I would give Deb my pole and go back to tie on another lure. Of course before I finished or as I was finishing, it would all start again. We broke off on four fish after landing seven and we really had enough fish. However, I decided to get a bigger rod with bigger line and see if I could catch one of the fish that was breaking us off. 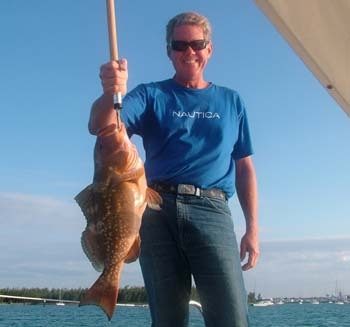 I caught and landed, with Deb's help on the gaff, the snowy grouper you see to the right that measured 26 inches long. This was the biggest we caught with 3 others being very respectable fish. Tom and Susan stopped by and after we talked for awhile and Tom caught a couple of small groupers, we went over to Tom's boat where we cleaned the mess of fish and of course had a fresh fish dinner. The fish was excellent I don't think you can get it much fresher. The other good news is my motor mounts have shipped and should be in sometime today. We have plans for the afternoon so at worst case I should be able to pick them up tomorrow morning and get the front mounts installed before we get into more exciting things like taking Jimmy Buffett (our bird) to get his wings trimmed. Who knows, perhaps there are still stories in Key West. 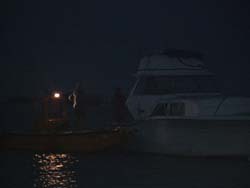 March 11 - We have been fishing around the boat and as you saw earlier, we have caught some grouper. Three days ago, I caught one of the biggest fish of my life. Or perhaps I should say, I hooked one. I was fishing on one of my small Bass fishing rods with a bass fishing reel for some smaller fish. All of a sudden I saw a monster fish come from beneath the boat and the line went ZING with the drag going out faster than I could turn this fish around. I could tell when it hit that it was a Tarpon and it boiled the surface about 20 yards from the boat. I yelled for Deb who was below to get the camera but she was indisposed. 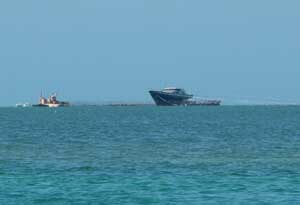 The fish surfaced again next to another boat about 100 yards from our boat. It started tail walking and the other people on the boat were quite impressed. About this time I ran out of line on my reel and the Tarpon broke off. I thought to myself, this was such a great one time experience. I was smiling ear to ear and laughing at the same time. It is just too cool to have a 5 to 6 foot, 60 or so pound fish on when you are using 14 pound test line. The next day, I got my engine mounts in and installed. For anyone interested, I have created a separate page outlining the procedure since it would bore anyone but Gemini owners. Click here if interested. On Saturday we hosted, for the second time, Pat and Paul on our boat. 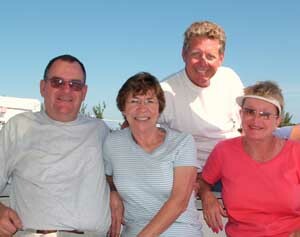 We have known Pat and Paul since we met at the Sullivan Airport in Missouri. We had both built our own airplanes, Paul a Long EZ and me a KR-2. I talked them into going on a flying vacation with us in 93 to Panama City, FL and then on to Ft Walton Beach. It was during this trip I told them about our dream to sail away into the sunset. We also took a 4 hour sail trip with Captain Chuck on this trip. Bottom line is that Missouri changed their retirement formula and Paul retired and bought a boat two year later and went cruising. I always said he stole our dream. He sold that boat and then they went out to Colorado for a ski season and figured out real quickly they didn't want to be cold that long. The next year they bought "our" Gemini 105 and called the night they completed the purchase. I asked, how did you like the way it sailed? He said, "We didn't sail it. 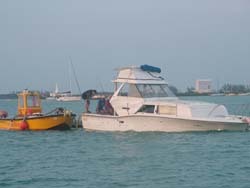 You said it sailed great and we just wanted to see if we could live on it." I thought that was the end of our friendship but told him we would buy it from him when he was done. 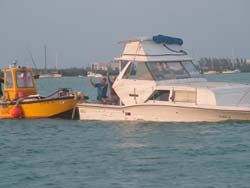 They loved the boat and cruised it for 3 1/2 years. As with his airplane, he is a meticulous as me about maintenance. 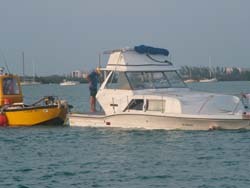 We bought our boat from them in 2001 and today we had a great day sailing with them along with catching up in Key West. I was telling them about how we were catching fish off of our boat so I picked up a rod and went up and said if I don't catch a fish in 3 casts then I won't catch one today. The rod I had was a small graphite crappie rod with a small spinning reel. Again, I had 14 pound test on the rod. I expected to catch a small grouper which I would throw back. 2nd cast guess what? I caught another Tarpon. These fish can fight and I mean real hard. Remember I'm fishing with a rod that has a recommended line weight of 6-12 pound line and I have 14 pound test on it. 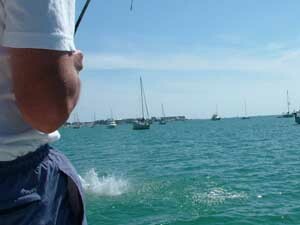 I have hooked up a 60-75 pound Tarpon which is taking line like there is no tomorrow. 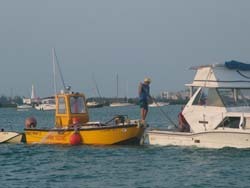 Unbelievably I was able to turn the fish after walking half way around the boat and ducking the rod under the line attaching the dinghy to the boat and around the two aft stays. The fish stayed down pulling away and we made our way forward of the boat and I then had to pass it around the the forward stay on the boat. Of course things weren't done yet. The fish was heading to the back of the boat and we were about to go around again. I was making progress and I had some line back on the reel and couldn't believe it. I might actually get a picture of this one. 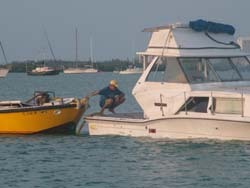 Well we went under the line for the dinghy again and we were then fighting the fish off of the back of the boat, again. I was able to get the fish within 15 yards when it started up and Deb was only able to get the picture of the splash when it came back down. After 15 minutes of fighting the fish it then broke off. I couldn't believe it was on this long and my right arm was really tired from fighting this Tarpon. TOO MUCH FUN!!! We then took Pat and Paul out to see the Legacy. You can see that they are in the process of setting something up so they can remove the beached Legacy from the position it has assumed. We won't see it removed since we are leaving on Thursday, we hope if weather cooperates. Key West has provided us with great entertainment, the opportunity to get into cruising and a place to host our many guests. We will finish up this week getting everything ready to leave and then we will start up the East Coast on a very slow exploring trip. Although are ready to leave Key West, we are also very comfortable here knowing where everything is and having made a large number of friends. While we have enjoyed Key West, it is time for us to resume our cruising. For those following our progress, things are about to get more exciting with new anchorages and places to visit.